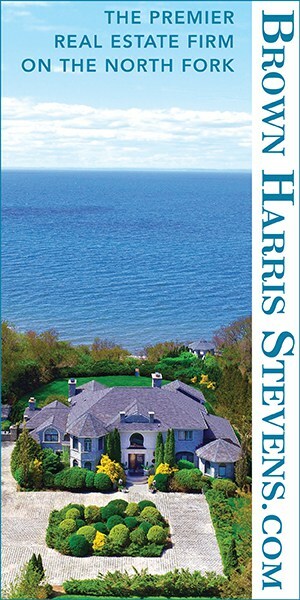 The Goods – Located in Harbor Lights and nestled along Southold Bay is this thoughtfully designed home. Each room, deck, and patio are perfectly positioned to take in this tranquil 100 feet of waterfront. Lush landscape provides great privacy. This well-appointed home has 3 bedrooms including master suite, 3 baths, 2 fireplaces, game room, hot tub and a 40-foot floating dock. 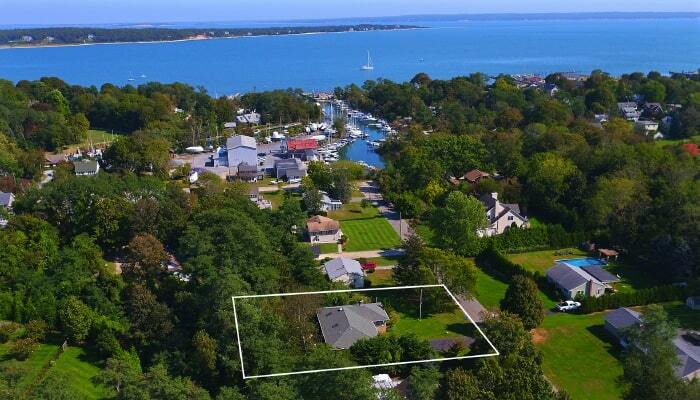 Close to North Fork award-winning vineyards, renowned restaurants, and farm stands. The Goods – This light and bright mid-century home offers a comfortable and spacious layout including living room with wood-burning fireplace, dining room, eat-in kitchen, three bedrooms, and two full baths. The updated kitchen has granite counters and stainless appliances. A covered porch and patio behind the attached garage face the large, private backyard. Situated between two creeks, with a marina down the street and sandy bay beaches just blocks away, this is the perfect North Fork setting. 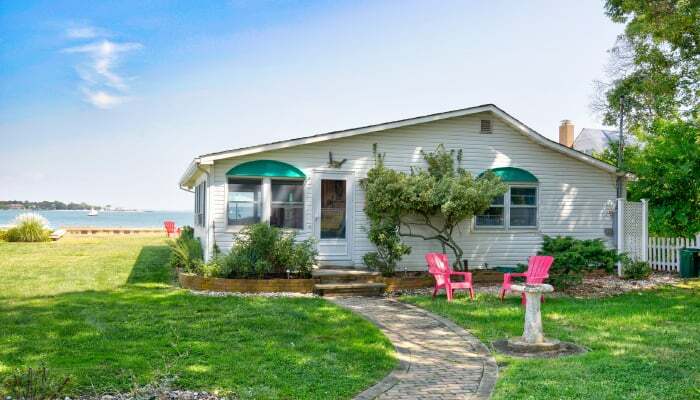 The Goods – This vintage 1960s cottage is the perfect summer waterfront retreat. With 70 feet of bay front on Pipes Cove you will enjoy all the pleasures of summer fun right from your backyard! Updated kitchens and baths and plenty of room for entertaining inside and out. The Goods – Overlooking Arshamomaque Pond surrounded by preserved lands and Town nature reserve, Arshamomaque Lodge is a special island oasis featuring a 5,000 square foot waterfront residence with double-size in-ground swimming pool, waterside tennis, and other amenities on 18 acres consisting of salt meadows, lawn, and woodlands. Designed for entertaining, the living room features a red-brick fireplace and vaulted ship-lap ceilings. A second fireplace is located in the pool-side den. Large eat-in kitchen overlooks freshwater pond teaming with waterfowl. First floor master suite with sitting area and Jacuzzi-style bath; additional bedrooms and bath upstairs. The Goods – This is a 5 bedroom, 3.5 bath home. Includes legal 2-bedroom apartment, living room with fireplace, family room with wood stove, generous eat-in kitchen, foyer, laundry room, attached garage, and third floor finished storage area. This family location in Mattituck has safe streets to bike on. The Goods – Stately with the classic lines from the 1920s, the main house features a formal dining room, gas fireplace anchoring the living room, four season sunroom for year-round entertaining. For day-to-day living, the main floor offers a den, half-bath and large eat-in kitchen with breakfast nook and adjoining mudroom/laundry. The bedroom level offers 2 bedrooms sharing a hall bath and a home office as well as an owner’s suite with bedroom, bathroom, and deck. The yard is full of charm with an in-ground pool and sitting area that takes advantage of the classic barn and architectural details of the main house. Tucked at the rear of the one acre parcel is a charming 2 bedroom ranch with enclosed porch, large open living room, and eat-in kitchen. Property is on street gas for heating with separate meters for utilities. Very unique! 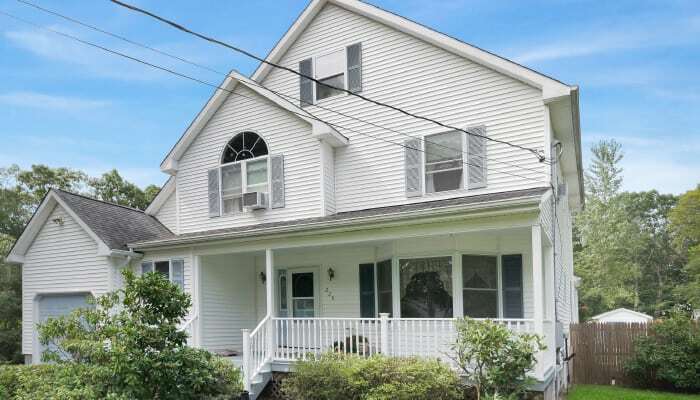 Why it’s a good deal – “Offering a unique opportunity, this Southold Village location offers the flexible housing options. Peace of mind with extended family on one property and centrally located to the village for modern family living on the North Fork. Take a moment to consider this while planning your future housing needs,” says listing agent Jerry Cibulski of Century 21 Albertson Realty.